In the likes of Morbid Angel and Suffocation, Grinning Ghoul started out as a death metal band. Sven Van Den Broeck, Leslie Andries, Occulta and Steven Heirwig started the band as Cacodaemon, a name that didn't stick with people so easily. Later the group was renamed to Grinning Ghoul, and with this line-up the first song "Bound To Absu" came to be. A first line-up change happened about 6 months after they started. 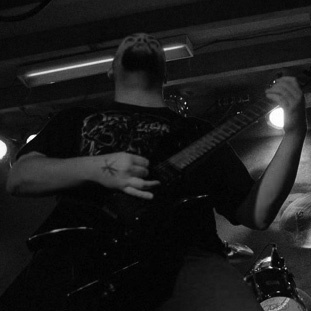 Occulta left the group so he could fully concentrate on "Avatar", a well respected black metal underground group. Steven was kicked out and both were replaced by Mattijs Buys and Spawn Daemon. Filip de Winter replaced bass about a year after the original formation of the band and with this complete line-up they could start making records again. Their first demo was called "Al Azif" and came to be late 1996 at "Nightingale Studios" in Berchem - Belgium. On the demo tape there was "Lifeless Lady", "Daemonical Existence", "Spawn The Rage", "Touch Of Sickness", and "Bound To Absu". A great deal of the lyrics were influenced by H.P. Lovecraft and The Necronomicon. The first gig took place in Lier, at the Prins Kardinaal. Joining them on the gig were Orchrist and Avatar. They recieved good reactions and Grinning Ghoul was climbing upwards on the metal ladder. Grinning Ghoul suffered a huge blow when members Spawn Deamon and Sven quit. Almost a year went by without any noise from the band. Patrick Smolderen (Patje) later on joined the band on second guitars. The sun really started shining when Sven came back again and pretty soon they were working on new material and playing more gigs. In 1999 another member left the band. Filip left the band and was replaced by Maes Patrik (Metal Pat). Three months after this they started recording for "Beyond The Mirror" at "Cavern Studios" in Antwerp - Belgium. The sound quality of the cd wasn't exactly how they wanted it to be but nevertheless the combination between Thrash metal and Death metal was very well recieved and the reviews were positive. 2002 brought more big changes for Grinning Ghoul when the band got Ivan on keyboard in the group. The idea was to experiments and change the style a little bit. In March 2002 Grinning Ghoul bagged their first gig outside Belgium on the Thrash 'Till Death tour with Flesh Made Sin, Suhrim and other bands. Differences finally became too big and the band blew up, leaving everyone to persue personal interests. The band was reformed and after some struggle they released Coming Of War in January of 2003, which was recorded in "Harrow Studios", Losser - The Netherlands.